Director Tom Paton really impressed us with his debut feature, PANDORICA - a well thought out sci fi/fantasy thriller which played on the myth of Pandora's Box. For his second, and much bigger budgeted film, Tom has produced a horror film which mixes a conventional trope - vampires - with an original and refreshing take on things. The protagonists of the film are Josh and Beth, a young couple very much in love but there's an undercurrent of sadness to their relationship, as Josh has been diagnosed with Leukaemia. He downplays it as much as possible but every now and then he suffers from a coughing fit, which Beth can only stand by and watch in helpless frustration. The fact that there are but two main characters gives a big clue that this isn't exactly a conventional horror film. Usually you'd expect to see a group of about five protagonists, four of whom will most likely be dead by the end! The fact that we spend more time with Beth and Josh means that we get to know them a bit better than we might otherwise. We get insights into their thoughts and how they bond and grate in equal measure. Their relationship is way past the initial romance stage and the shadow of Josh's illness looms over them. Beth puts on a brave face but is preparing herself for the worst, while Josh refuses to have a proper discussion about it. There is a certain amount of levity in the script. Josh and Beth's teasing is quite fun and the characters of Steve The Ranger and Vincent also add an element of comedy. There's a very amusing scene when Josh storms off in a huff to get more firewood and starts to take his frustration and anger out on a tree branch, only to come a cropper in the process and have to hobble back to camp all contrite. The film has a pretty original take with its vampires. They are totally feral, and have no dialogue except through hissing and screams. They have an animalistic way of running. You may wonder if they were ever actually human or are a completely different race altogether. The film itself treats the situation as if Josh and Beth are being attacked by a pack of wild animals. Redwood didn't have a massive production budget but I'd guess it was significantly more than Pandorica, which was all filmed around one location and set over one night. 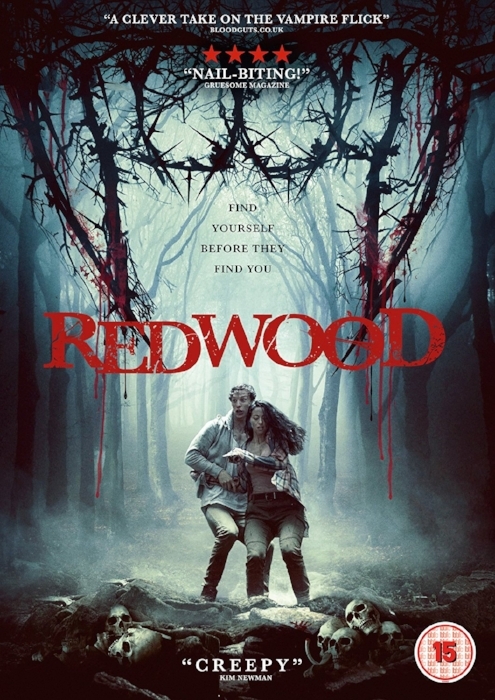 The Redwood Park setting (actually shot in Poland) gives the film a much more expansive feel, using a number of different and picturesque settings throughout and has some overhead drone shots showing just how dense the forest is. Even if there weren't vampires knocking around, you'd be very wise to stick to the paths lest you get lost amongst the trees! There is a "less is more" approach to the vampires but when you do see them up close the make-up design is very good. This isn't going to be a film for gore-hounds but there are some good visceral moments dashed here and there. As with Pandorica, the photography and cinematography are very good, with Tom Paton collaborating with cinematographer George Burt once again, as well as Mike Stern Sterzinski as DP this time round. One of Pandorica's big pluses was the night-time photography and the same can be said here. With the cast being so small, the two protagonists are having to carry the whole film more of less on their own, so luckily they both bring their A-game to it. It's a bit weird having a pairing made of a British lad and an American girl but the dialogue comes across as unforced and natural for both. Tatjana Nardone makes Beth a very sympathetic character, the more sensible of the pair. Mike Beckingham gets a standout sequence late on when he has to run through a number of different emotions without any dialogue, and its a really great moment. Nicholas Brendon gives the film a bit of a lift with his name being in the titles but he also delivers a great performance with short amount of screen-time. He's able to give Vincent an air of mystery and menace, world-weariness and danger. There was a huge weight of expectation on Redwood's shoulders, thanks to the quality of Pandorica, and we've had to wait patiently while the film toured the festival circuit and picked up numerous awards. So it was with some relief to discover that the praise hasn't been in waste. Other than a small slow patch, everything in this film works really well and once the film reaches the Ranger's outpost and mausoleum the pacing ramps up and the film delivers some real shocks.